Well, dark passengers, the wait is finally over. Season 4 of Dexter begins in a little more than 3 hours from now. Are you excited yet? Okay, so we’ve got a new serial killer nemesis and a little dark passenger baby. Don’t mention any spoilers if you’ve been reading ‘em, but what do you want to see/think will happen in the new season? I’ll start us off with my own little Dexter musings once we cover what we know from the previews on Showtime. Special Agent Lundy (FBI Profiler from Season 2) comes back to town. He’s now retired, but still after a serial killer. He asks for Dexter’s help. Dexter and Rita are now married, moved into a new house in the suburbs and have welcomed their bundle of joy into their home. Daddy Dex isn’t sleeping and he’s making mistakes – both with his day job and his nocturnal huntings. Dexter and Debra are married. Yeah, okay, they aren’t married on the show because that would be sort of gross since they were raised as siblings, but in real life Michael C. Hall and Jennifer Carpenter are husband and wife. I’m a little twisted so I always like to look for ways real life relationships color the on-screen dynamics. John Lithgow guest stars this year as the prolific and deadly Trinity Killer. Dexter’s secret revealed! No, I don’t the whole world to know he’s a serial killer, but I think it’s time for someone close to him to figure it out. Can you even imagine the awesome scenes involved with Debra or Rita coming to terms with what Dexter is? Rita becoming a victim of the Trinity Killer. Okay, hear me out…it’s not like I want Rita to die or anything. But, considering the fact that Dexter claims to have no emotions or strong feelings for others, how would he react to his wife being kidnapped and/or murdered? It could be the fodder for some MAJOR character development. That’s all I’ll add for now. Your turn. 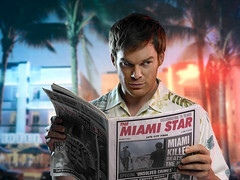 What do you want to see in the new season of Dexter?